Speedball Water-Soluble Block Printing Inks print in bold color and dry to a rich, satiny finish. Available in 27 brilliant colors including 3 process, 5 metallics and 6 fluorescents across 5 sizes, these inks are great for printing with linoleum, wood or soft block surfaces onto paper. Safe for use in the classroom, all colors carry the AP Seal and clean up easily with soap and water. What does water-soluble mean? 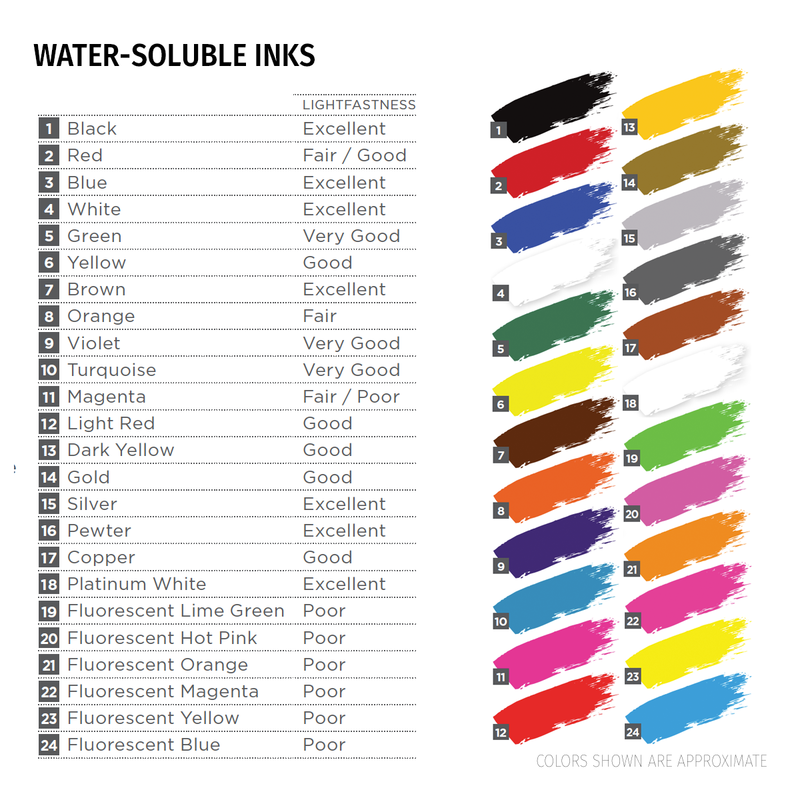 Water-soluble inks are formulated to be dissolvable by water. This means that the inks will move, bleed or rinse off when encountering water after printing. Can I remove Speedball’s Water-Soluble Inks from my clothing? Speedball’s Water-Soluble Block Printing Inks can be removed from clothing. As quickly as possible, blot the excess ink from the fabric. Place a stain remover (e.g. Tide, Shout, etc.) to pre-treat the area and then wash as directed. What is the open time for Speedball’s Water-Soluble Block Printing Inks? While superior to the open time offered by competitive water-soluble block printing inks, Speedball’s Water-Soluble Inks do dry more quickly than oil-based alternatives. Environmental factors like humidity and temperature can also impact the ink’s open time. To increase working time, simply add Speedball’s Water-Soluble Block Printing Ink Retarder during roll-out. Speedball’s Water-Soluble Block Printing Ink Retarder: Slows ink’s drying time while maintaining viscosity; Speedball’s Water-Soluble Block Printing Ink Transparent Extender Base: Creates subtle, transparent colors while maintaining viscosity; Speedball’s Water-Soluble Block Printing Ink Pearlescent Base: Adds shimmering/iridescent effects to water-soluble ink colors. What surfaces can I use with Speedball’s Water-Soluble Block Printing Inks? Speedball’s Water-Soluble Block Printing Inks are ideal for printing with linoleum, wood or soft block surfaces. They are also suitable for use with polyprint plates or Styrofoam. What brayers are recommended for use with Speedball’s Water-Soluble Block Printing Inks? Soft Rubber Brayers are ideally-suited for use with Speedball’s Water-Soluble Block Printing Inks. Speedball’s Water-Soluble Block Printing Inks are also suitable for use with Foam Brayers. Are Speedball’s Water-Soluble Inks available in sets? Yes! Speedball’s Water-Soluble Block Printing Inks are available in (3) Sets--Block Printing Ink Starter Set: Includes (6) 1.25oz. tubes of Water-Soluble Block Printing Ink (Red, Blue, Yellow, Black, White, Gold); Basic Block Printing Ink Set: Includes (4) 1.25oz. tubes of Water-Soluble Block Printing Ink (Red, Blue, Yellow, Black); Block Printing Metallic Ink Set: Includes (4) 1.25oz. tubes of Water-Soluble Block Printing Ink (Silver, Gold, Pewter, Copper).